Slip this ornate 1.25 Carat t.w. 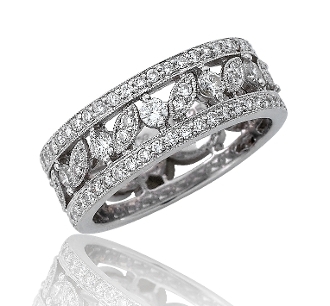 brilliant round cut Diamond wedding ring on her waiting finger and a world of love and happiness opens up for you both! Over a 1/2 ct. of round prong-set Diamond solitaires sparkle beautifully, accented by pave-set Diamonds that flow throughout this one of a kind design on each side of the band; as well as placed in an elegant, openwork leaf design. All set in highly polished 18 Karat white gold. For added appeal personalize your item, select our Engrave option and indicate size needed when adding to Cart.